Story by Milli Thornton. Photos © Brian Williams & Milli Thornton. WE TOOK THIS trip in 2007, but I couldn’t bear to leave these pictures in a dusty dungeon. New Orleans is something that simply MUST be shared. We visited NOLA two years after Katrina. Had we not known about the hurricane, as mere tourists we might never have guessed. 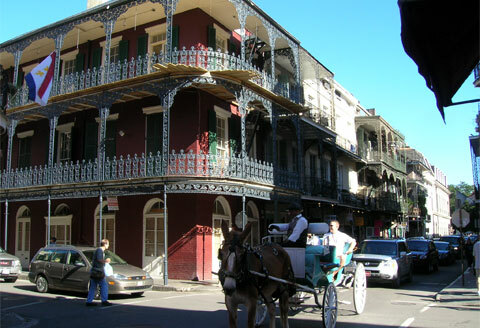 There wasn’t much about the French Quarter that made it obvious. This was particularly true of the spirit of that part of the city. It felt like business as usual—including the business of enjoying life, music, food and festivities. The parade in the feature photo is a prime example. Green was a theme of the parade . . . but it was October so it could not have been a St. Paddy’s Day parade. Or maybe it could. One gets the impression that any excuse for a parade will do. The two ladies in a squat near the police rail were doing a down-and-dirty black mama’s dance that had the policewoman on duty pointing with glee. The fact that one dancer really was a black mama—and the other was a redhead in a green T-shirt who looked to be straight from Ireland—seemed entirely fitting. 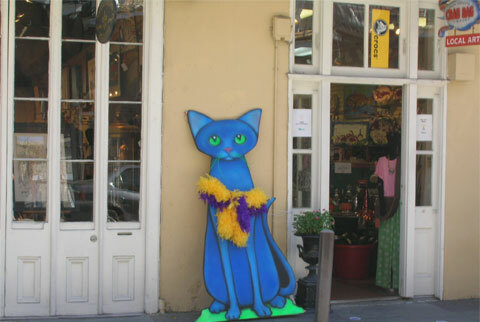 The Quarter is full of eclectic and whimsical shops packed with gifts and curios. Very hard to resist. We had a budget to stick to, which was good because you could easily fill your house from one trip to the French Quarter. I couldn’t resist including this classic scene (below) of horse and carriage with a backdrop of New Orleans state flag—proudly bearing the gold fleur-de-lis, which is emblazoned on everything from T-shirts to coffee mugs—and framed by French Quarter architecture. The cars definitely looked out of place. Why rush when you can travel with elegance? 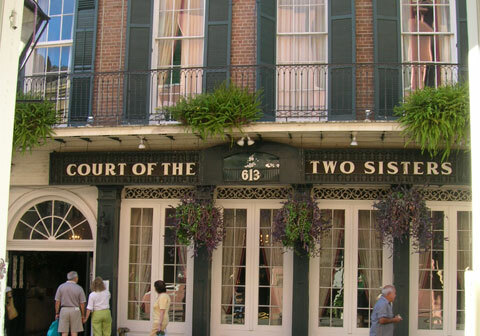 I loved the look of the Court of the Two Sisters from the street. It looked like it might contain the kind of romantic courtyard I’d been hoping for. It did, and there was a bonus: we got to eat Cajun food while sitting outdoors. The table for two was tiny and we were crowded in with the other diners, but that felt right. You can’t keep this city at arm’s length! In the evening we wandered the path along the riverbank where people ride bikes or stroll with their kids. Some take the trolley. I didn’t get to ride it (pout). Oh, well. Another reason I need to go back. Brian hates posing for photos and I couldn’t get him to crack much of a smile. But you can’t do New Orleans without bringing home a photo of a paddleboat. 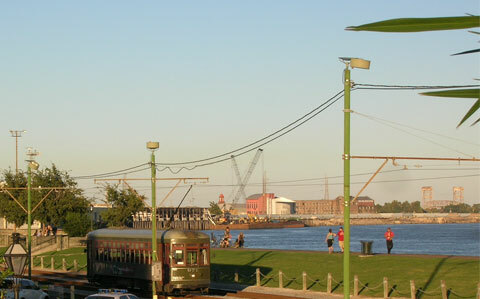 Despite the cranes of industry poking the skyline (as seen in the trolley photo), the river is beautiful in the evening. 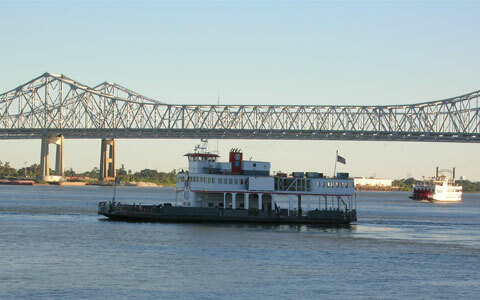 We had to tear ourselves away from watching the boats ply the waters of the Mississippi. 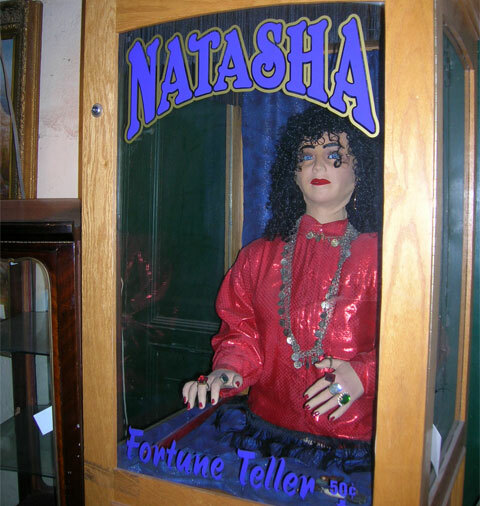 Last, but by no means least, is Natasha the Fortune Teller. Put a quarter in her slot and she will read your fortune . . . and give you your lucky Lotto numbers to boot. You will use a mysterious device run by a tiny chip to transmit your tales of travel to far-flung readers. Beware of addiction to this device. Uncanny how accurate she was. A place I’ve wanted to go. How colorful it is! The blues and reds – so vibrant. 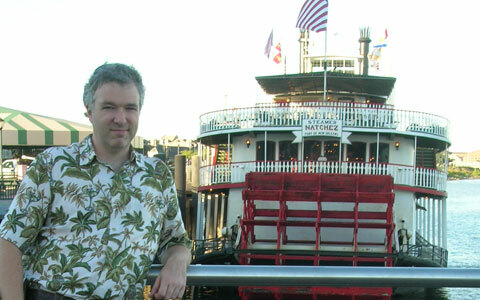 Have never done a riverboat cruise. Your pics have refueled my desire to go. Tend to do the Europe thing, but this would be a nice break from that. Courtyard eating is my favorite (that and on the riverbanks. )thanks for the idea. I’m the same. Looove vibrant colors! I’m so pleased our pics refueled your desire to go to New Orleans. Putting this story together did the same thing for my desire to go back again. Your photo of the classic scene with that wonderful building and the Court of the Two Sisters are what especially caught my eye! Can you tell how much I love architecture? I laughed when I read, “The two ladies in a squat near the police rail were doing a down-and-dirty black mama’s dance that had the policewoman on duty pointing with glee. The fact that one dancer really was a black mama—and the other was a redhead in a green T-shirt who looked to be straight from Ireland—seemed entirely fitting.” I had noticed the picture right away and thought “What the heck are they doing?” Because it didn’t look like dancing!! What a fun trip you had. I think Brian had to keep a stiff lip to keep you off the paddle-boat so you could see more stuff in one day rather than lingering on the river. If he melted and cracked a big smile you would have run past him to the boat and he would be unable to detain you by then! Glad you liked the story. Thanks for the fun comment! Milli, the squatting ladies – ohmy! funny – & I wouldn’t even have noticed the policewoman pointing if you hadn’t pointed her out! Then Natasha and her brilliant advice and your adorable bio pic – wow! So glad you didn’t leave the New Orleans pictures “in a dusty dungeon”! Pleased you liked Natasha’s advice to me. I should follow the “beware” part better – LOL!